If you are not sure Scuba Diving is for you, this is perfect. This is a one day non-certified introduction to Scuba Diving. It is a taster of the fun to be had Scuba diving. Some diving skills, a little theory and then we jump into the pool and then the sea for an amazing diving experience. If you get the “bug” this course counts towards your Open Water Course. This Discover Scuba Diving introductory Course will then allow you to dive for one year, under the supervision of a PADI Dive Instructor to a max depth of 12 meters. The is a great choice of scuba diving courses in Cape Town. For the beginner to more Advanced, we run these all year round. The PADI open water is the first Certified PADI Scuba Dive course and is recognized worlwide. It takes 3 days. All PADI books with crew pack and suba hire included, registration with PADI. Theory/Dvd’s, knowledge reviews. 5 Pool sessions and 4 sea dives, two of which we can do off a boat. On completion of this course, you can Scuba Dive Independantly anywhere in the world to a max depth of 18 meters. From there you can move onto the Advanced course this course really gives you much more diving experience and an insight into some of the speciality courses. On completion it allows you to dive to a depth of 30 meters. This course takes 2/3 days and comprisises of 5 sea dives. Including a deep dive and navigation dive, as well as choosing 3 dives such as wreck dive, night dive, Naturalist and Search and Recovery. Two dives will be done off the boat. All PADI books with crew pack and scuba hire included, registration with PADI. All your PADI Advanced dives count towards its particular PADI Speciality course. Scuba Dive SA – PADI Scuba Diving in Cape Town – Scuba Diving is an exhilarating, fun, safe and exciting hobby for all the family. So read on and Learn to Scuba Dive! Scuba Dive South Africa is run by Justin Villiers an experienced Independent PADI Master Scuba Diver Trainer. 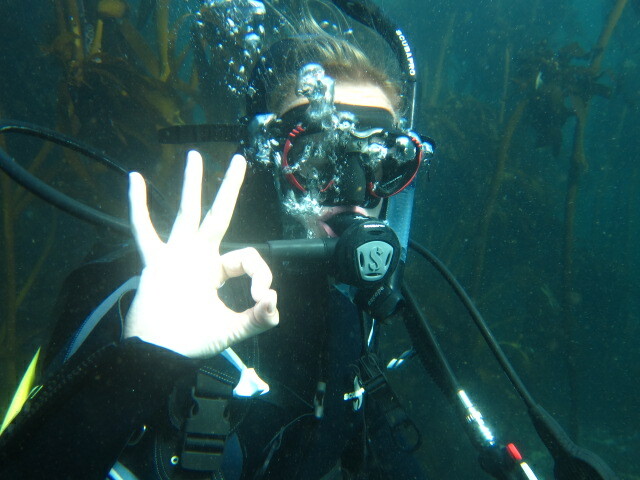 We operate out of Muizenberg, on the doorstep of False Bay and its spectacular and beautiful dive sites. With its vast range of marine life, corals, reefs and ship wrecks, the experience of learning to Scuba Dive is second to none. Cape town is one of the best places to learn to dive. Justin has dived all around the world and still believes Cape Town Scuba Diving Sites are the best. We can offer a variety of PADI Scuba diving Courses for the beginner to the more advanced. Full equipment rental, accompanied boat dives and shore dives. Diving with Cow sharks or seals and exploring some of the many shipwrecks dotted all around the coastline. See the underwater beauty of False Bay and the Atlantic, it is an experience you will never regret. We pride ourselves in our professionalism and extremely high standards of teaching PADI Scuba Courses. We offer personal tuition and work at the pace of every student. So whether you are a local or visiting on holiday contact us today. Learning how to scuba dive can be accomplished by practically anyone, provided you learn from a qualified diving instructor before you take to the water. Besides, no dive shop or charter boat will take you diving without proof of proper training and certification. So, the first step is, learn to scuba. Before you start dive training, there are a few health requirements. All certifying agencies will require a certificate of good health. This may involve a visit to the family doctor. For most people this will not be a problem and the doctor will give the thumbs up. The few exceptions might be people who have some type of heart or ear problem.